Whether you are a pilot, owner, passenger, scheduler or dispatcher, we are completely devoted to adding value to your aviation experience everytime you fly into Bismarck, ND. We are the home of the region’s largest aircraft maintenance and avionics facility, and professional aircraft fueling service. We have over 40 skilled aviation professionals that are ready to serve any of your specific needs. Our staff is 100 percent committed to ensuring that you receive courteous, prompt and professional treatment at all times. As a full service FBO, our business continues to evolve to meet your changing needs. We strive to be the regional FBO that aviators talk about when discussing outstanding service in our industry. 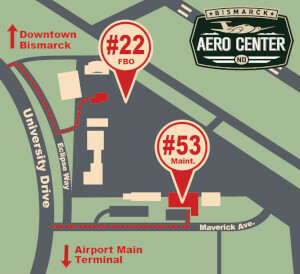 Give us a call and find out why over 85% of local customers choose Bismarck Aero Center for their aviation needs! 20 Minute or less quick turns!